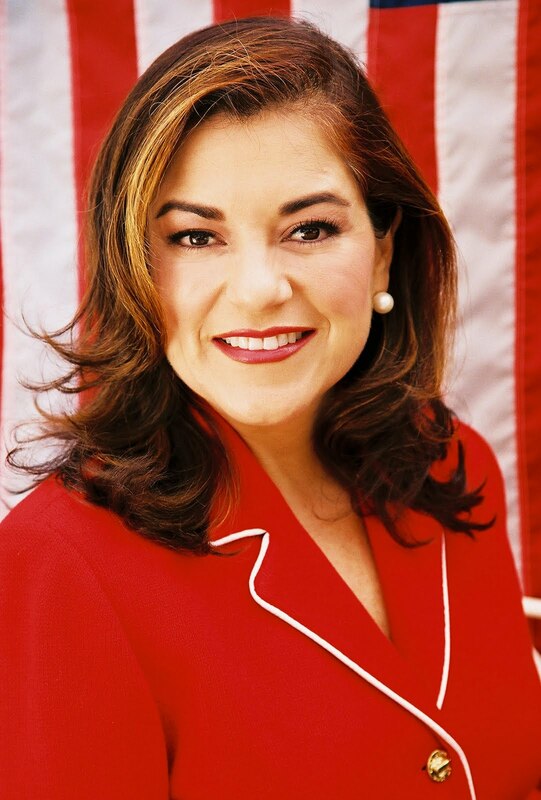 Thank you to Congresswoman Loretta Sanchez (CA-47) for her co-sponsorship of HR 4601 The National Nurse Act of 2010. Congresswoman Sanchez proudly serves the 47th District of California. She began her career in November 1996 and is currently concluding her 7th term in the U.S. House of Representatives. The Congresswoman serves as Vice-Chair of the House Homeland Security Committee and is a member of the Subcommittees on Border, Maritime, and Global Counterterrorism and Emerging Threats, Cybersecurity, and Science and Technology. According to Congresswoman Sanchez’s website, she is a firm believer that every American, and particularly every child, should have access to quality medical care. She was a proud supporter of H.R. 2, the State Children's Health Insurance Program (SCHIP) Reauthorization bill, which was signed into law by President Obama on February 4, 2009. The SCHIP law will preserve healthcare for the 7 million children who are currently covered by SCHIP and extend coverage to an additional 4 million uninsured children who have been eligible for, but not enrolled in, SCHIP and Medicaid. We must point out to the lady that this reform on health care is still much to improve and that there are millions of people still waiting for proper care, hopefully helping people who suffer pain really are millions at the country level, to obtain the benefits they need. Letter to the Editor Published! Gallup's annual survey of professions reports nurses are the most trusted profession in America for their honesty and ethical standards. When I want to learn what is happening in health care, I turn to nursing publications and research. I am thus pleased that legislation has been introduced in Congress called The National Nurse Act of 2010, which finally establishes an Office of the National Nurse within the Public Health Service. The National Nurse would provide leadership to strengthen nurses' efforts with a nationwide cultural shift to prevention. The Office of the National Nurse is needed to slow the growing epidemics of preventable chronic diseases, to promote health awareness and increase health knowledge, and to promote health careers and strengthen health infrastructures. As trusted frontline health educators and caregivers, nurses have a long history of expertise in health promotion to improve health outcomes. Nurses know that a healthy population strengthens families and communities in many positive ways. So does Congresswoman Carol Shea-Porter, as one of the earliest supporters of the The National Nurse Act of 2010. Thank you, Carol, for being a congressional sponsor of this important legislation and continuing to work on behalf of all of us in the 1st District." 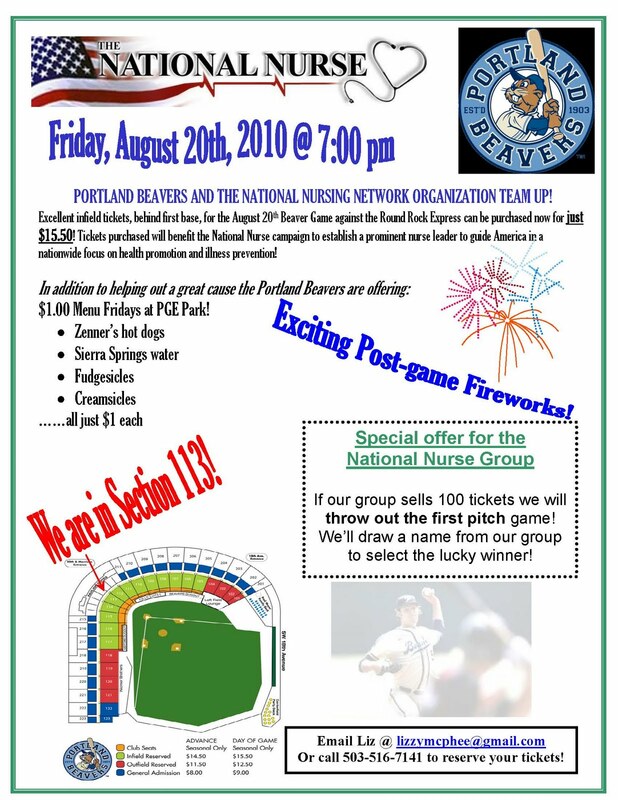 Portland Beavers Baseball Team and NNNO Team Up! On Friday, August 20th from 7:00 pm - 11:00 pm the Portland Beavers Baseball team has generously donated a portion of ticket sales in Section 113 to help benefit the National Nursing Network Organization's efforts to establish a prominent nurse leader to guide America in a nationwide focus on health promotion and prevention. Supporters soon will be traveling to DC to educate members of Congress and leaders of national organizations about the importance of HR 4601 The National Nurse Act of 2010. The game will take place in PGE Park located at 1844 SW Morrison in beautiful downtown Portland, Oregon. Excellent infield tickets located behind first base at just $15.50 are available for this game featuring the Round Rock Express and the Portland Beavers. Plan to stay after the game to enjoy a post game Fireworks show. The Beavers also offer a $1 menu on Fridays so everything from hot dogs to ice creams is just $1! Email Liz to purchase your tickets today! If you can’t attend the game but would like to support this cause, please consider purchasing a ticket for a child who would like to attend the ball game but can’t afford to do so. A grassroots campaign is underway to create an Office of the National Nurse. The initiative calls for a national nursing leader, similar in stature to the U.S. Surgeon General, who will serve as a figurehead for nurses around the country, and spearhead health prevention efforts. The movement has received much support, and there is legislation now in the U.S. House. I wondered what a national nurse would do and why supporters felt there should be one, so I spoke with Teri Mills, author of the original New York Times op-ed that first suggested the idea back in 2005. Mills is the president of the National Nursing Network Organization, which was founded to campaign for the national nurse initiative. She says the beauty of the position is that the framework already exists and a little effort could make the position a leader in health prevention, working with organizations such as the American Heart Association and National Kidney Association, to improve Americans’ health. Mills argues that a National Nurse could provide leadership to the nation’s 3.4 million nurses to deliver the message of prevention in multiple languages to every American by partnering and strengthening the work of existing groups, including the Office of the Surgeon General. The grassroots campaign has been gathering momentum over the last few years. It does not employ professional lobbyists in Washington. Instead, it relies on support from nurses in the field who are slowly spreading the word and debating whether a national nurse can be a unifying voice for the profession. Mills encourages nurses to visit the website to learn more about what she believes a national nurse could accomplish. In the meantime, although the bill has 17 cosponsors, it will likely need another trip through Congress before it gets close to passing. The National Nursing Network Organization is soliciting input from across the healthcare spectrum to craft a bill with the best chance of success. Rebecca Hendren is an editor with HealthLeaders Media. She can be reached at rhendren@hcpro.com. Thank you to Congressman John Olver (MA-1) for his co-sponsorship of HR 4601 The National Nurse Act of 2010.